Here's a guide on how to unlock and use the Limit Break option to your ninjas. 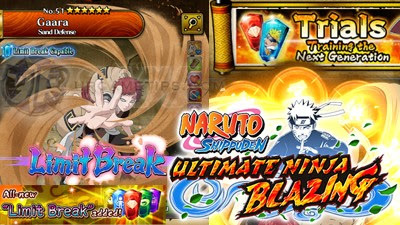 - Once you reach the Lvl cap of your core ninja and he or she can no longer be awakened, the only thing left to do now is to use the Limit Break option (if available). - Per Limit Break, you can increase the Lvl cap of your ninjas to +5, thus increasing their stats potential. - For 5* ninjas, you can Limit Break 1+5 times = Lvl 70 to Lvl 100. - For 6* ninjas, you can Limit Break 1+9 times = Lvl 100 to Lvl 150. - Most 4* ninjas from Raids (Emergency Mission drops) can be upgraded to 5* and use Limit Breaks, giving F2P players a chance to get some Lvl 100 ninjas! - Note that not all ninjas can be Limit Broken. - Some 6* and other selected 5* ninjas can be limit broken. To check, Awaken them until you reach their maximum number of Stars, if the "Limit Break Capable" icon is present on his or her character profile, then you may continue. - Note: More ninjas will also get their own Limit Break option as the game goes. - In order to unlock the next Limit Break cap, your ninjas must always reach their current Max Lvl first. - Farm the scrolls you need from their respective Scroll stages under Emergency Missions, then use the "Awaken" option to upgrade them. Note that this is the only way to get 4* Scrolls. - You can upgrade a 1* Scroll to 2* by using five 1* Scrolls. - You can upgrade a 2* Scroll to 3* by using five 2* Scrolls. - You can upgrade a 3* Scroll to 4* by using five 3* Scrolls. - Can be farmed from their respective Elements under Trial Missions: Rank [A] or [B]. - Also check the featured element, if you are up against a mono Heart enemies, then just counter them with an all out Body team, or at least don't get Skill ninjas into that battle. - Can be obtained from the Trial Coin Exchange Shop using Trial Coins farmed from Trial Missions or completed mission rewards. Granny Cat's Hiding Place will also sell these items (limited time). Trial Coin Exchange Shop: NEW! - No more hard and RNG drop runs! The newly revamped Trial Missions are now easier. 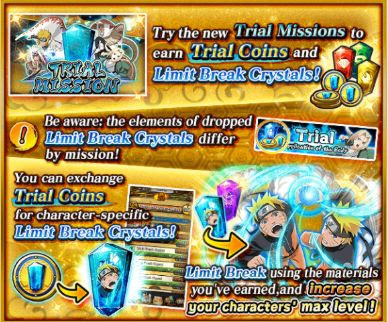 - At the Trial Coin Exchange Shop, you can now exchange Trial Coins earned from Trial Missions for character specific Limit Break Crystals. - Limit Break your favorite ninjas to make them an even greater force to be reckoned with! - Note that only select characters are available from the Shop. - Drops from the "Ruler of the Serpents" Impact Raid Rank A and S missions. - Drops from the "Raging Fury" Impact Raid Rank A and S missions. - Drops from the "Battle in the Final Valley" Impact Raid Rank A and S missions. - Drops from the "Lord of Silence" Impact Raid Rank A and S missions. - Drops from the "Arrival of a Savage God" Impact Raid Rank A and S missions. - Drops from the "A Ferocious Visage" Impact Raid Rank A and S missions. - Drops from the "Two Tailed Cat Demon" Impact Raid Rank A and S missions. - Drops from the "Force of Justice" Impact Raid Rank A and S missions. - Drops from the "Darkness of the Ninja" Impact Raid Rank A and S missions. - Drops from the "From a Snake to a Dragon" Impact Raid Rank A and S missions. - Drops from the "Origin of Destruction" Impact Raid Rank A and S missions. - Drops from the "Chance Encounter at the Edge of Hell" Impact Raid Rank A and S missions. - Drops from the "The Hour of Revival" Impact Raid Rank A and S missions. - 5* ninjas doesn't require any Character specific Crystals, but 6* ninjas on the other hand will require lots of them, so get ready for a world of pain! - From Lvl 100 to 105 = No Character Crystals needed. - From Lvl 105 to 125 = Start farming Character Crystals. - From Lvl 125 to 150 = Farm and Awaken your 5* Character Crystals to 6*! - 1 Base, plus 3 pieces of 5* Character Crystal dupes (4 pieces total). - 3* and 4* Scrolls (one each). - Yup, get ready to spend millions if you want to reach their true MAX Lvls. - As always, Short ranged ninjas will get higher stats increase than Mid and Long ranged ninjas. 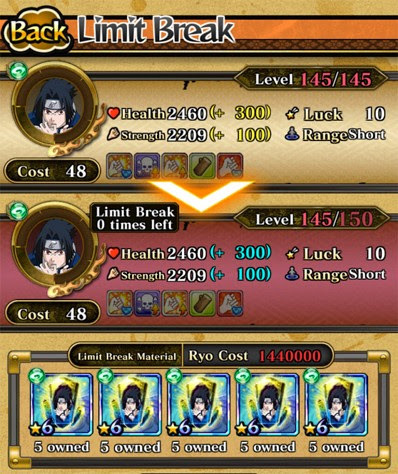 So if you can't decide which one to Limit Break first, I would suggest that you go for Short ranged ninjas first to maximize their stats and to compensate their short attack range.